When images of a peacock flash across our minds, we can't help but think about Carly Simon's famous song, "You're so vain". But the Peacock is more than just a pretty bird. Native to India, the Peacock has become a symbol of Royalty, Divinity, and Nobility throughout the folklore of this region. The Peacock Throne was once a coveted seat of power crafted in the 1600s for the ruler of Persia, Shah Jahan, the man who built the breathtakingly beautiful monument, the Taj Mahal. Peacocks are also integral parts of many world religions. In Christianity, the White Peacock is believed to be a secret symbol of the Church and Jesus Christ and artists from the Medieval and Renaissance periods would include this sign as a tip of the hat to the religious nature of their artworks. In Buddhism, the Peacock is a totem of openness and honesty. A peacock isn't afraid to show the world it's true self, even if it means that doing so makes it vulnerable. Hindus see the Peacock as an avatar for the goddess Lakshmi and a sign of Prosperity and Good Fortune. The Peacock is also a renowned lover. Males are the only ones with the brightly coloured plumage, which they readily spread in display dances and mating rituals in order to attract a female. These birds are also emblems of Wisdom and Knowledge. The eyelet feature of the tail feathers was seen in ancient Greece as the "All Seeing Eye" and the bird became the totem for the goddess, Hera, queen of the Olympians. Sadly, Hera was known for being the jealous and vengeful type who sought the destruction of anyone who she considered to be more beautiful than her. No wonder the Peacock has been branded as an emblem for egotists! During the Medieval Era alchemists used peacock feather for every concoction that they created. The Peacock and its feathers were symbols of Renewal and Healing. The bird was seen as an equivalent to the rising Phoenix. This belief stems from the fact that peacocks are known to be unaffected by the copious amounts of toxins that they consume. In fact, it was not uncommon to find artwork in which the Peacock was battling a venomous snake. This idea may have led to the Christian belief that peacocks could ward of the Devil and his demons (snakes are symbols of evil and sin). It may surprise you to know that peacocks were once a culinary treat reserved only for royalty. A sprawling peacock on a platter was a way for kings and members of royal courts to show off, a concept that ties in with the bird's image as a narcissist of sorts. This idea is what inspired the American TV network, NBC, to use the Peacock as their logo. "We're as proud as a peacock!" was the slogan for the network and it is rumoured that the use of the peacock image was geared at taking advantage of the new technology introduced at the time, the color TV. A peacock inspired logo also exists for the Pakistan Television Corporation. A White Peacock is a rare find, as such it is highly revered as a religious symbol. 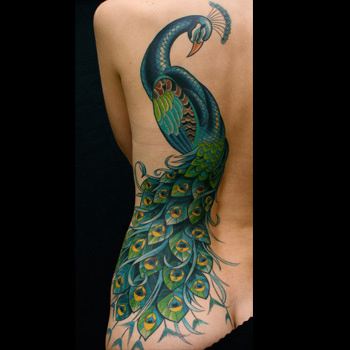 White Peacock Tattoos are a tip of the hat to many of the core concepts of Christianity, including spiritual renewal, purity, and humility. It is believed to be a symbol of Jesus Christ, as such, a White Peacock Tattoo represents your deep rooted, sacred Christian beliefs and engenders a sense of renewal and enlightenment. A peacock's plumage represents more than just narcissism and vanity. Sure, a peacock in full display is taken as a sign that one has an overinflated ego, but in general, feathers have been for thousands of years, symbols of Healing and Renewal. A peacock feather is an emblem of Healing and also is believed to be a sign of immortality, due to the fact that the peacock is impervious to many of the plant toxins it regularly ingests. In the Greek culture, the feathers represent Knowledge and for Hindus, it is a sign of Kindness and Compassion. Bring out your true self with a Peacock Tattoo. This design is more than just an emblem for vanity and self-absorbance; it is a beacon for Purity, Piety, Healing, and Compassion. Your design can be as creative as you desire, all you need is a little imagination and lots of pretty colors. Creating a unique design is a daunting task, but the team of artists www.itattoodesigns.com can help you channel your inner Da Vinci. Simply visit our design page and take advantage of our Custom Design Service.